“The flooding this year could be worse than anything we’ve seen in recent years, even worse than the historic floods of 1993 and 2011,” said Mary C. Erickson, deputy director of the National Weather Service, in a conference call with reporters. 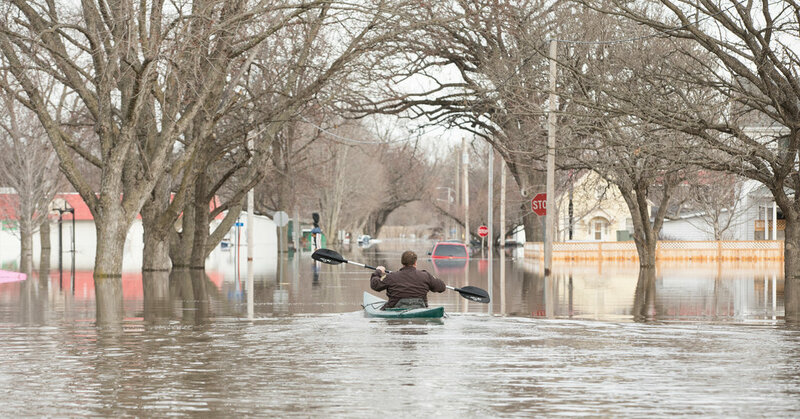 The major flooding already experienced in Nebraska, Minnesota, Iowa and elsewhere is “a preview of what we expect throughout the rest of the spring,” she said. Some 13 million people could be exposed to major flooding in their communities, said Edward Clark, director of NOAA’s National Water Center. This flood season is “potentially unprecedented,” he said, and more than 200 million people could experience some flooding in their communities. Scientists have said that increasing rainfall in the Midwest is a predictable consequence of climate change, since a warmer atmosphere can hold more moisture, which comes down as precipitation. The current flooding in the Missouri River basin and beyond has been caused in part by heavy rains, but has been further complicated by other factors, like frozen ground that kept water from being absorbed. The basins of the Upper Mississippi and the Red River of the North have already been hit with rain and snow this spring of up to twice normal levels. Further expected rainfall and melting snow will add to that flooding and extend it through the central and southern United States. NOAA identified the greatest risks for moderate to major flooding in the upper, middle and lower Mississippi River basins, the Red River of the North, the Great Lakes, and the eastern Missouri River, lower Ohio River, lower Cumberland River and Tennessee River basins. Government scientists said that much of the United States east of the Mississippi River, as well as parts of California and Nevada, could expect to see minor flooding in the spring.